Home | LITFL | Clinical Cases | Gut ache or Gordian knot? Gut ache or Gordian knot? A 29 year old man presents to the ED with 4 hours of colicky left lower quadrant pain. The pain came on rapidly, not long after breakfast, and is associated with nausea. It is aggravated by lying back, and eased by leaning forward and lying on his left side. He has passed flatus this morning but not opened his bowels. He has no urinary or bowel changes, and no past medical history of note. On further questioning, he reports two similar episodes in the past ten days, both causing him to present to hospital, however the pain improved both times within 8h following treatment with analgesia and buscopan. He has been well in the intervening period. On examination his vital signs are unremarkable, but there is marked guarding over the left umbilical area, with a palpable boggy and tender mass, roughly the size of a fist. Bowel sounds were not detected. His FBP, UEC and CRP are all within normal limits. 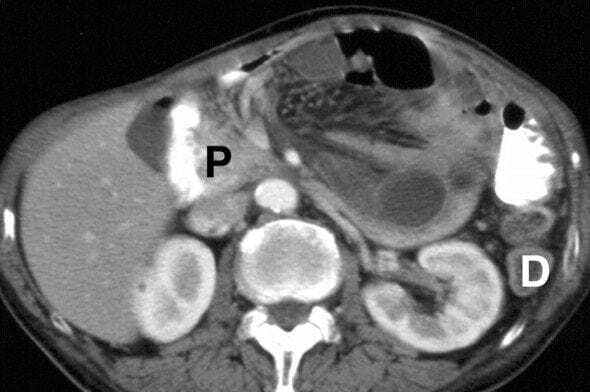 …a saclike mass of dilated jejunal loops between the pancreatic head (P) and stomach. The descending mesocolon (D) and stomach are displaced laterally. The dilated inferior mesenteric vein is located at the anterior border of the encapsulated loops. Q2. How common is this condition? 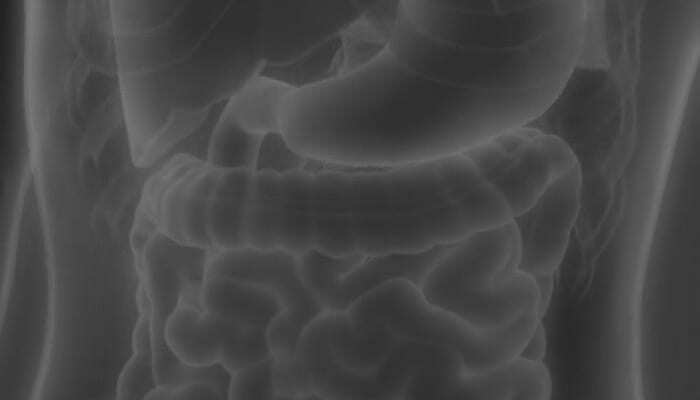 Internal herniae are an extremely rare cause of small bowel obstruction. Reported incidence is 0.2-0.9%. Paraduodenal herniae are the most common type of internal hernia, reportedly causing 53% of internal herniae. They are more commonly left sided (approximately 75%). Q3. What is the cause of this condition? Internal herniae are an abnormal protrusion of a viscera (usually small bowel) through the peritoneum or mesentery into another abdominal compartment. The underlying cause can be congenital, or acquired through such means as surgery, trauma or inflammation in surrounding tissues. Q4. What other types of this condition exist and what is their relative incidence? Q5. What are the clinical features of this condition? Diagnosis is difficult due to the generalized nature of symptoms. The most common reported symptoms are intermittent and nonspecific obstructive complains such as nausea, periumbilical pain and distension. Symptoms may be vague and intermittent, Patients often only present as acute obstruction when the hernia is incarcerated. Symptoms are often worse with eating or standing, and relieved by lying down or fasting. Internal Hernias are rarely diagnosed on clinical grounds only. Q6. How is this condition diagnosed? Takeyama, N et al. CT of Internal Hernias, RadioGraphics 2005, 25, 997-1015.